I didn't manage to upload any pictures here (no working SD card reader) but Viper uploaded a few from his phone, including the three of us (L to R Viper, Maverick, and me, Heavy.) 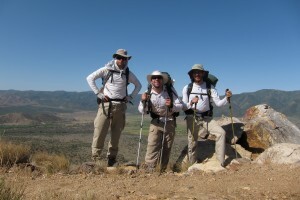 The matching attire is just a coincidence -- we apparently all had the same thoughts about desert hiking. More photos soon, hopefully from Idyllwild in 66 miles. Quite a coincidence of dress! -- you all look well-adapted. Wish we were there! That's exactly how I dressed my first year at Burning Man. Turns out it's not what one should wear to Burning Man, but apparently, perfect for desert hiking! Glad you're back on the trail.